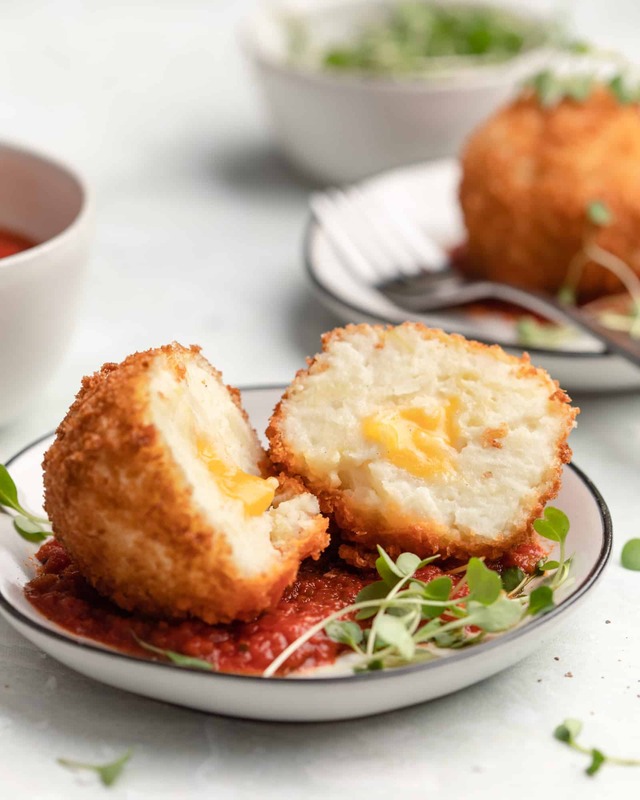 Cheesy Fried Mashed Potato Balls are a comfort food appetizer or side dish made with mashed potatoes, filled with melty cheese and fried with a crispy panko breading. 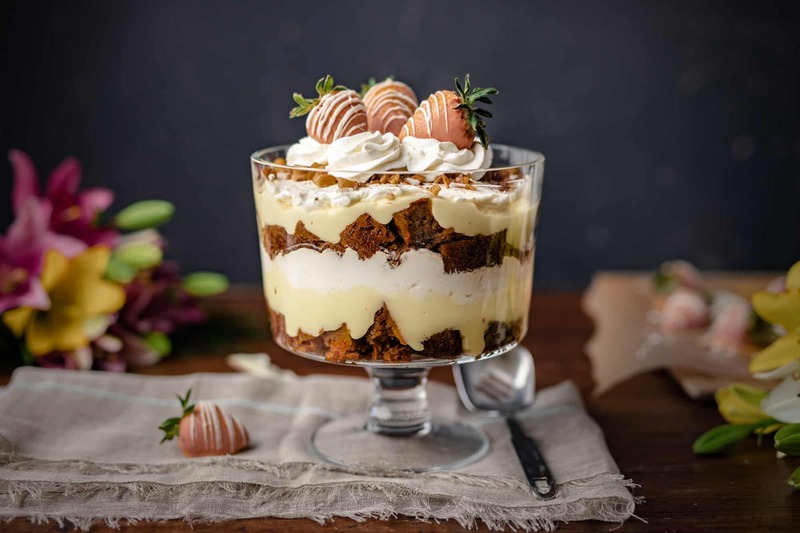 A great way to use of leftover mashed potatoes! 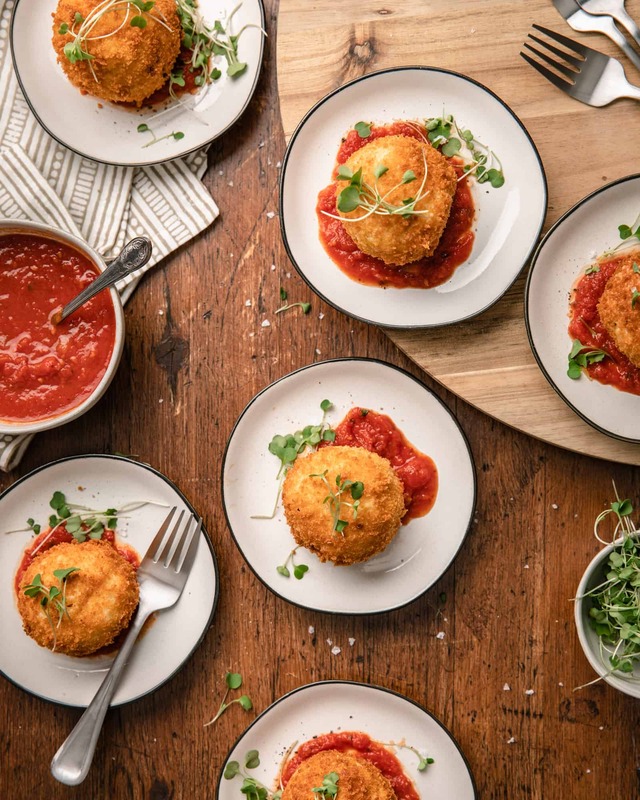 I love to make these fried mashed potato balls as a first course for a dinner party or serve up a platter of them at an open house. It’s hard to resist anything combining potatoes and cheese. 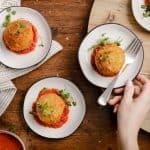 Too, if you’re like me and like to get creative with a recipe, you have endless options for the kind of cheese you can use inside of these mashed potato balls. Mozzarella is another big winner for this recipe. Pictured here, you can see I served them with a tangy marinara sauce, but pesto, ranch, alfredo, really any savory dipping sauce would also work well. You can either make mashed potatoes per the recipe below or use up leftovers. I love to make these as a Black Friday appetizer when I have leftover mashers from Thanksgiving. The only thing to pay attention to is the consistency of the mashed potatoes. Some folks like to prepare theirs a little on the thinner/sticky side. Just know that the potatoes need to hold up to being rolled into a ball. Like this. I also roll them in flour to help the panko breading to adhere. If you’re not used to frying, it can sound a little scary. But, I promise, it’s not as bad as you think! You just have to keep two things in mind for that perfect golden browned crust on your cheesy mashed potato balls, or anything fried for that matter. Pick the right oil – you will want something with a high smoke point so that you can reach frying temperature without burning the oil and the food. I love to fry with coconut oil for this reason. It’s also very neutral in flavor, though just ever so slightly sweet. But, vegetable oil, avocado oil, and peanut oil would all work, too. The right temperature – Frying works best at 375F. I use a candy thermometer to ensure my oil is the right temp before adding the food to be fried. Consistent temperature – You want to maintain in the 350F to 380F range during the frying process. The best way to do this is to not add too many balls to the oil at once. I was using a 5 quart pot and was able to fry three at a time without too much variation in temperature. Too, I like to use cast iron because it does a better job of holding heat compared to other metals. When they’re all done, frying, I place them on a cooling rack inside the oven at 250F to keep warm until they’re ready to serve. The time in the oven also helps to ensure the melty cheese factor. These can also be made in advance! Prepare them per the recipe except don’t put them in the oven to keep warm. Just let them cool, place them in an airtight container and refrigerate. Then, when you’re ready to serve them, heat the oven to 350F and bake them for 12 to 15 minutes until heated through and the breading has crisped up again. What kind of sauce do you think you’ll serve these with? I’d love to hear your comments below! Mashed potatoes, stuffed with cheese then fried, for a comforting appetizer or side dish! Once potatoes have cooled and are easy to handle, scoop out some potato with your hand (approximately 1/4 to half cup…depending on the size you want your balls). Roll the mashed potato scoop into a ball and the take a piece of cheese and press it into the center of the ball, rolling the ball more to cover up the hole and ensuring the cheese is in the center. If you need help covering the hole, just add more mashed potatoes, like edible spackle. Repeat until you’ve used up all the mashed potatoes (approx 16 large size potato balls). Once all balls are formed, heat up the oil over medium high heat to a desired temp of 375F and pre-heat oven to 250 degrees with a cooling rack inside. The oil should be deep enough so that a ball can be half submerged. Take a ball and roll it in the the flour, dusting the outside. Then roll it in egg, coating it. 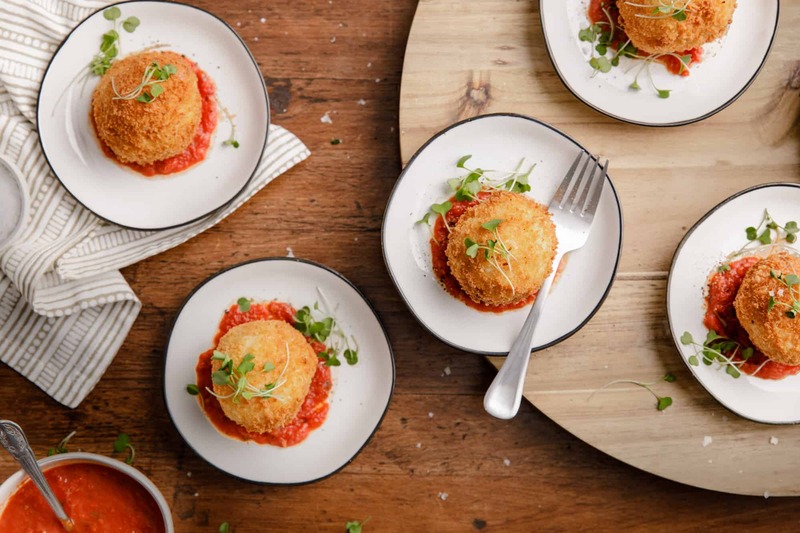 Allow excess egg to drip off and roll the ball then in panko. The egg should cause the panko to adhere. Place panko coated ball in the frying oil and allow to sit for 45 seconds undisturbed, then turn it in the oil once a minute until browned and crispy on all sides. Once fully browned, using tongs, place finished balls on the cooling rack in the oven to keep warm and cook through the cheese. 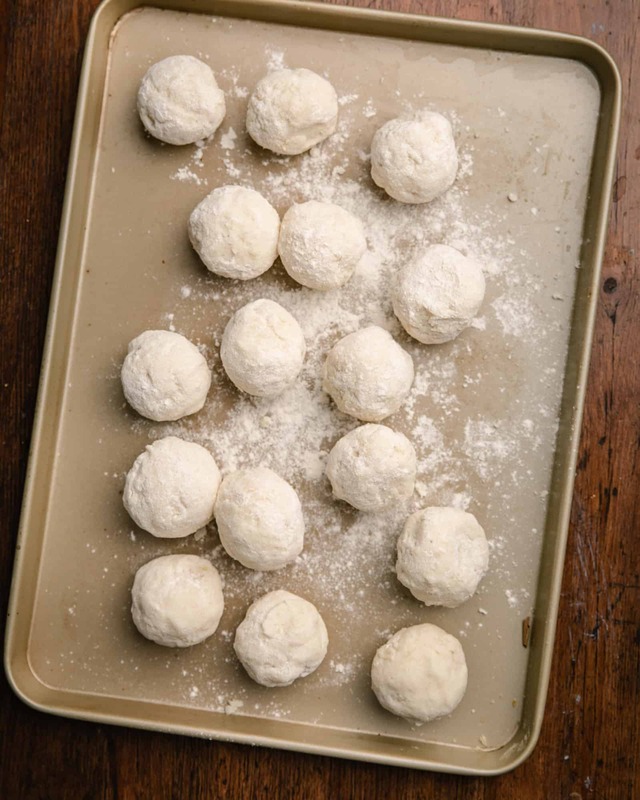 Repeat with each ball, dredging in flour, egg, panko, frying and placing in the oven. Serve the potato balls warm so that the cheese is melty. Optional garnish can include your favorite marinara or fancy ketchup. For the frying oil, I especially like using coconut oil because of the high smoke point. Oil should be at 375F to achieve a nice fry.